CarLoanExpress.com and John Figueroa specialize in getting people who are in an open or discharged Chapter 7 or 13 find financing for quality NEW or PRE-OWNED cars, trucks, vans or suv’s of all makes and models. We can help you drive home today. We have the car you want and the credit you deserve. Simply complete our FREE, SAFE, SECURE, AND EASY no obligation car loan application by going to www.CarLoanExpress.com or calling our credit hotline at 1-866-291-3773 today. We work with an extensive group of local and national lenders to provide you with the very best in financing that you qualify for. You can rely on us for affordable, hassle-free finance options. Rebuild your credit while driving a dependable, reliable and affordable vehicle from John Figueroa and www.CarLoanExpress.com . Do I have to work with a car salesman? No. The complexities of financing a vehicle during or after bankruptcy mean you work directly with John Figueroa. Why buy from John Figueroa and CarLoanExpress.com? The most important question to ask is who to turn to for that all-important credit rebuilding auto loan after bankruptcy. The answer is John Figueroa and CarLoanExpress.com simply because we do everything possible to get you financed despite your circumstance and years of experience. Absolutely, positively every single time! Can I get a car loan if I have an open or discharged bankruptcy? Yes. We specialize and strive in aiding folks after they have applied for bankruptcy protection, whether it was chapter 7 or chapter 13, with financing and the purchase of a new or pre-owned vehicle. Either way you’re better off if you contact us as soon as possible so we can begin the process sooner rather than later or Click here to apply today. We have access to a number of new cars, trucks, vans and suv’s to those who qualify, we are not one of those typical car dealers out there that may try to put you in a car just to get you in something so that they can make a profit. We are all about you and we strive hard to prove it, everyday we put people in cars that they can be proud of and rebuild their credit at the same time. We carry a huge selection of quality makes and models at all times, not just one or two cars in a particular price range but dozens and dozens. Odds are we have the car you have been looking for. Filing bankruptcy doesn’t mean you have to settle, get the car you deserve! Click here to apply today. How long does it take to apply for a loan? The online car loan application at www.CarLoanExpress.com doesn’t take long at all, usually you can apply in less than three minutes. Will my purchase rebuild my credit? Definitely! A car loan financed over time is one of the fastest ways to raise your credit score. Each payment improves your credit – all while driving a nice ride. Will my loan report to the credit bureaus? All loans arranged by us will, but many other auto dealer’s loans will not. We only use major companies that report to all three credit bureaus. Click here to apply today. Will I need a large down payment? Won’t my credit get better if I just wait? Credit doesn’t get better with time, it generally gets worse. Somewhere in your credit history is proof you paid on time for a period of time. If that falls off your credit bureau, you’ll be a higher risk. Establishing a fresh auto loan paid on time will help. Will my information be shared with anyone? Your credit and personal information is secure and will only be shared with lenders who specifically want to approve your auto loan. We never provide your information to marketing interests. Absolutely! Your information is always confidential. How can CarLoanExpress.com get me approved when other dealers can’t? Our special expertise is in structuring financing for consumers that makes it easy for lenders to say “yes”. 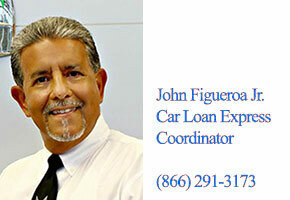 John Figueroa takes the time to understand your credit situation and match it to one of our many financing programs. I have helped thousands of folks just like yourself since 1994 with purchasing a new or pre-owned vehicle either during or after bankruptcy. I welcome the opportunity to assist you too!